I got back to practicing on Annie again last night. Jamie recommended that I change thread colors and just quilt over my practice piece again instead of loading a new piece of muslin. It's a great idea, but you can't see your quilting as well. I changed my thread to an orange shade. I had fun trying some new designs. I doodled some deconstructed feathers. I think they'll look nice in borders. I also had fun quilting some allover swirly flowers. It's kind of hard to see them, but I really like how they look too! Look at those loops!!! I think my exact words were "#@!!&*%$@**!!" Really?? Thank goodness Jamie went over in detail how to fix tension because after a few adjustments, it was back to perfect. I'm home today until it's time to take the girls to dance. I plan on loading a new practice piece so I can see my quilting better. Tonight I will work on "Hop To It" while the girls are at dance. Hopefully, tomorrow I can post some progress on that!! After much thought, I have finally picked the name "Annie" for my A-1. I've received several emails asking if I had named my machine yet?? I got the idea from my friend Kathy G. I always look for little "signs" or coincidences. While I was shopping LAs, I found it interesting that the machine I liked best, the A-1 Elite has the initials "A and E" just like Alyssa and Elaina. Coincidence, probably...or not? Trust me, that is not the reason I picked the A-1. :-) So I was explaining this to Kathy when she was over visiting before I received my machine and she mentioned the name Annie. It just kind of stayed with me and I think my machine looks like an "Annie" now. I seem to be a little frustrated with my practicing or lack of. I was getting a bit frustrated at the look of my quilting and have been avoiding practicing a bit lately. I was told this would happen. Scott keeps telling me "Just keep practicing and you're doing great!" I'm just going to have to work through this little "roadblock." I have received several emails regarding my fabric stash. It's small, but it does exist. All the fabric I own has been purchased with a project in mind. I rarely, if ever have purchased fabric just to build my stash. My brain just doesn't think like that...too bad it doesn't think the same way about shoes! All the fabric I have is leftover from a project, purchased for a project and then I changed my mind or it's been designated to a project I haven't started yet. About 3 years ago, Scott finished our basement. He did a wonderful job! He has a Michigan State Spartan area with cabinetry and mini kitchenette. Guess who stores her fabric in the cabinets on the other side of the bar?? :-) That is the infamous window. Last weekend went by so fast! I feel like I just wrote Friday's post. Saturday's Friendship strip exchange and sit 'n sew at the shop was so much fun! Everyone was cutting and exchanging strips for different projects from Edyta. I did manage to get some stripping done myself!! LOL! These are some of the strip sets I will be cutting my farmhouse blocks out of. Love the fabric! Most of the fabric is from the kit I purchased from Edyta, but I did end up swapping out a few strips for ones from the exchange. Pat, my co-host holding up one of her farmhouse blocks. She cut her strips a little wider than I did. I think I'm going to put a variety of sizes in my strip sets. Adds to the fun! Stephanie of Peas In A Pod joined us too! She worked on Edyta's "Tree of Life" quilt. Just beautiful! Stephanie participated in a triangle exchange a while ago and used them in her quilt. She worked on hand applique around the quilt. Wow!! I wish I would have gotten a better picture to show what a beautiful job she is doing! Stephanie and I had such a good time chatting! Made the day just fly by! She had company coming to her house that day, so I am glad she was able to spend a few hours with us. This is the Sizzix fabric cutter we use at the shop. Makes cutting strips a dream! It is so fast, easy and fun! Look at ALL the strips I came home with! I can't wait until next month when we exchange more. There are a few projects in Edyta's book that I am thinking of making with all my strips. I'd love to make them all, but sigh not enough time. I wanted to thank everyone for all the wonderful birthday wishes to the girls. They enjoyed each one of them! They had a wonderful time this weekend. Everyone aka Scott and myself survived! Yesterday we had grandparents over and my sister came home for the weekend. We had one little surprise left for the girls yesterday. We were all hiding cans of Silly String so as soon we sang "Happy Birthday" and they blew out their candles, we sprayed it all over them!! It was so funny! They SO were not expecting it! They were covered! They looked like Silly String sculptures! Scott videotaped the whole thing and we watched it several times last night. Laughing more each time! Glasses update...I will be picking them up Thursday! Yippee!! I will be getting my eyes dilated as well. Should be another fun appointment. I'm off to the bakery to pick up THREE DOZEN strawberry jelly doughnuts for the girls' class today! I love doughnuts. I've never met one that I didn't like. The girls are just like me! Of course, all the doughnuts aren't for the class...I had to get a few for home too! Tomorrow my babies will be 10 years old! To help kick off the celebration, I made them some cupcakes...to hang in their rooms! Aren't they just darling?? They are a free pattern design by the very talented Stephanie from Loft Creations. I love a calorie-free cupcake any day! Thanks for the cute pattern, Stephanie! Carol from Carol's Crafty Creations used the cupcake pattern and made a cute little birthday topper with a cupcake and a candle on top. So cute! I thought about putting a candle on these, but decided I'm going to embellish them with some cute buttons instead. I will look for some cute buttons over the weekend. Of course they are made out of the Bliss fabric collection by Bonnie & Camille. They will match their new Bliss quilts!! They look so cute in their rooms already! The big celebration kicks off tonight with a sleep over. Lucky me. Tomorrow will be a family day when I get home from the shop. Sunday is their birthday party with the rest of the family. A whole weekend of celebration! With a lump in my throat as I write this, it's still so hard for me to believe that it's been 10 years. It seems like just yesterday Scott and I were scrambling to get to the hospital because I went into labor 7 weeks early! We were so scared. We didn't even have a name picked out for Baby "B" yet. We had the name Elaina already picked out. We decided Baby "A" would be Elaina, but what about Baby "B"? We were so not prepared for that early of an arrival! We decided we both loved the name Alyssa. Well that was settled in a hurry! We had a very brief stay at the hospital because I was rushed by ambulance to a hospital that was equipped to handle the complications I was having. One very scary ride in an ambulance, scary few hours in the hospital and the girls were delivered...healthy and beautiful! Unfortunately, due to my complications, I didn't get to see or hold the girls for two days. Worst two days of my life. When I did finally get to see them for the first time, they were the most beautiful sight I had ever laid my eyes on!! Two sweet, tiny little angels. 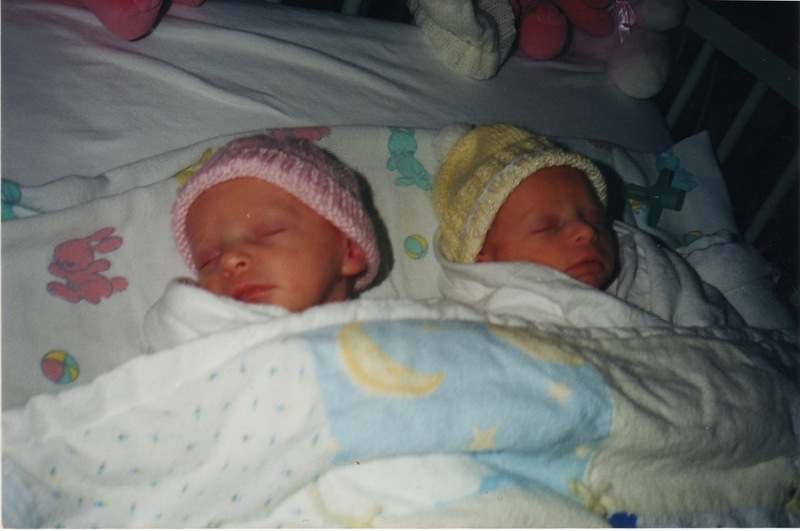 Happy 10th Birthday Alyssa and Elaina! Lots of exciting things going on this coming weekend. I know two little girls that will be having a monumental birthday this weekend. More about that tomorrow. Saturday at the shop is our first Friendship Sit 'n Sew group with myself and Pat, a quilter and fellow co-worker. Quilters can come and exchange strips, sit and sew or work on some of the projects From Edyta Sitar's new book Friendship Strips and Scraps. I think it should be a super fun day! 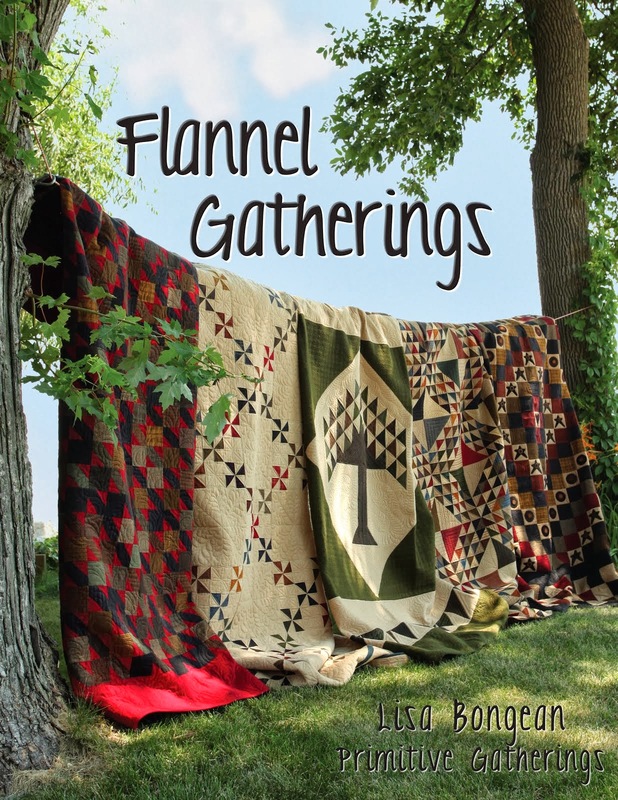 I will be working on the quilt that graces the cover of Edyta's new book. I was a little worried about gathering fabric for it because I have such a measly fabric stash. I think I will share that with you soon. I just love the way Edyta mixes her fabric up. I happened to mention it to Edyta and she offered to bring a kit for that quilt up to the shop. I was like "YES" that would be more than wonderful!! I think some of the other ladies jumped on board and bought kits too. 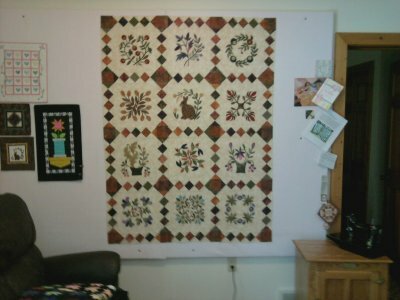 This is the kit for the quilt in the photo called "Farmhouse Quilt." Look at all those gorgeous fabrics! AND they are all labeled! The kit included the backing fabric as well. Best money I ever spent!! Hopefully, I'll remember to take lots of photos from Saturday. I'm pleased to report that my A-1 is purring like a kitten again! Jamie came to save the day yesterday. He fixed what turned out to be a very simple fix. One look at my machine, Jamie realized the problem and started laughing. When Scott replaced the cord for the stitch regulator, we plugged it back in backwards!! LOL! See the little white plug that now has an "x" marked on it, that was inserted backwards. We had no idea which way was the front of the plug or that it would matter. I had Jamie mark the x just in case, so I know for future reference. I just felt sooooo bad that Jamie drove back to my house. I'm so glad it was nothing. Jamie was even more relieved. He thought it was something very serious. He said the drive was well worth it. He is so sweet. While Jamie was here we went over a few more maintenance items. He also helped me pick out some threads out off a thread chart, that way I have an idea of what to order. The tread chart has hundreds of thread colors! I would order them all if I could, but that's obviously not practical. Unfortunately, no time to really practice after Jamie left because I had to take the girls to dance. I'm hoping I can get back to some practicing today! I also hope my glasses will be here soon! Oh, I also wanted to add that Kristin officially wore her white coat Tuesday. She said she received tons of compliments on her patch! The other PA students commented on how nice it was sewn on and how good it looked! They all wanted to know how she did it. She told them, "my sister is a quilter...she can do anything!" Or something like that. :-) I'm wondering if they attached theirs with superglue?? I'll fill you in on all the details Monday. After TWO HOURS at the eye doctor, guess what...my headache was back. Grrrrrrr! Not as bad as it was before, but I had a headache, yet again. I did manage to get just a few moments of doodling in Friday. Today I will be having my first "class" with Jamie at his studio. I will be heading over with a group of friends and fellow LAmers. Fun!! We will be learning about thread art. It's a drawing class. No work on the machines today. I'm very curious about how the class will be. I'm sure it'll be very helpful and informative. I've never taken a class I didn't learn something. I'll take lots of photos and share them with you! My new and very good friend Stephanie, aka Mama Pea at Peas In A Pod blog is having a very cute giveaway. Stop by her blog and check it out!! Stephanie's blog is awesome if you haven't stopped by there yet. She has some exciting things going on. 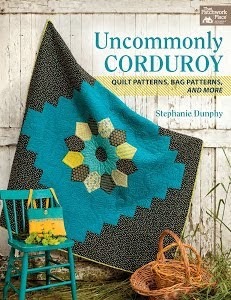 She was just chosen to be a Creative Consultant on Amanda Herring of The Quilted Fish design team!! I am so excited for her!! Congratulations Stephanie!